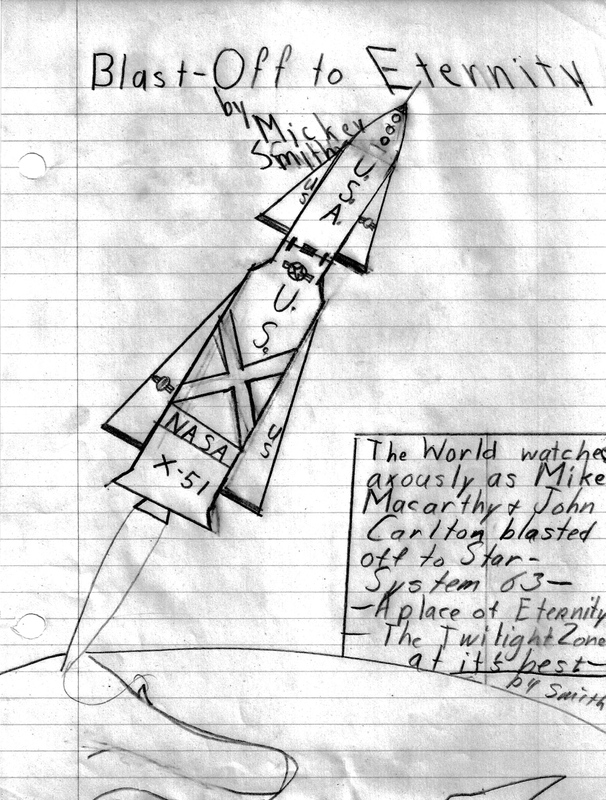 A previous post, The First Childhood Appearance of Jack Commer, covered the origin of my space hero Jack in the fall of 1962 and my elation at writing the story “Voyage to Venus” for a fifth grade spelling assignment. That story opened a happy new era in my writing (see Part I, First Efforts in The Gore Book) and led to thirty-three more stories collected in The Blue Notebook. 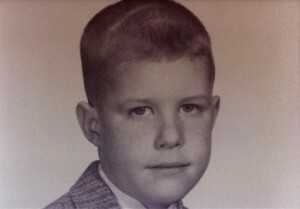 The author’s fifth grade mug shot, probably Fall 1962, at the time Jack Commer was created. I’m not sure exactly when I compiled them into a blue loose-leaf notebook, arranged by their event dates from 1860 to the year 6000, and wrote “BEST S.F. FROM EARLY Mickey Smith RECORDS” on the cover. But it was probably before all the stories were completed, as I knew as I was making them that they had to be preserved. All of them were shared with several other kids or else read aloud to my fifth grade class. I wrote twelve stories for that class, of which eleven survive. We were told to write stories into which we were to work something like ten new spelling words. I discarded the first story, an insipid detective plot I vividly recall hating as I composed it, but I also remember that after “Voyage to Venus,” the second story starring the newly-minted Jack Commer, I was eager to save them all. So eleven for class, and twenty-three composed on my own. Two were plotted with my fifth grade friend Vernon Cramer. “Smith and Cramer” was yet another writer association in addition to the epistolary exchanges of MSSR with Sabin Russell in New Jersey, though unlike MSSR, Smith and Cramer never had bylaws and was more of a series title I could plaster on some of the stories. But I wrote everything myself. I realize now that I’ve never thanked Vernon for his strange energy that further propelled my imagination. So thanks, ancient friend, you turned out to be one of my teachers. I know I’ve thanked Mrs. Grammar (that really was my fifth grade teacher’s name) a thousand times over the years. 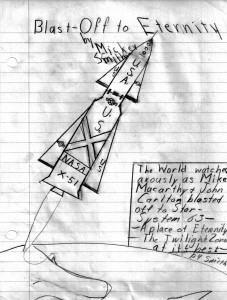 Mrs. Grammar’s fifth grade spelling assignments encouraged me to create, and I’ve never forgotten this special era where I grew as a kid writer. In addition to coming up with some fantastic plots and high energy writing that riveted everyone in the class, I also made my share of writing mistakes–a couple stories were bad ripoffs of movies I’d just seen, and sometimes I was boring, or I gave up and turned the story into a joke. I kept the failures anyway; at the time I wouldn’t have been able to put into words that the mediocre stories were a great learning experience, but of course that’s what they were. In The Blue Notebook period I wholeheartedly embraced the idea that I was a writer. I recall my eagerness to write at my desk the night before a story was due. Not only did I have full confidence that I could fit the spelling words into the narrative, but I also knew they’d assist me and that the resulting story would move in odd directions. I remember one night looking in the telephone book for character names–actual novelistic research! I was also aware that I was easily mastering adverbial phrases and dialog where others in the class could not. It all seemed natural, in retrospect as if I’d done this in a previous lifetime and was now simply picking up where I’d left off. Okay, so a lot of my spelling was atrocious. Otherwise, the style is damn fluid for fifth grader rough draft. One of the bizarre aspects of The Blue Notebook is the massive amount of flippant self-promotion I plastered across the beginnings and ends of stories, the flavor of which I’m sure I picked up from book covers, TV commercials, and movie posters. All this would probably have been fertile ground for a child psychologist. “The Gap in the Earth,” for instance, begins with the admonition that this is “A great novel by Mickey Smith.” At the conclusion of “February 11, 1971, DOOMSDAY” we are told: “In three months the Earth will be at war with Guacoazezama. Don’t miss it!” There are outlandish series titles like “Case 3 of the New Fritening Experiences,” illustrated ads for the stories, movie poster come-ons, concluding statements blaring that “This has been a Mickey Smith Film Presentation,” complete with unreeling film showing stills from the story, and unabashed declarations that Mickey Smith is, like Sabin Russell, O.O.T.T.G.P.O.E. (one of the two greatest people on Earth). The best stories instinctively seem to grab the reader with some grotesque dinosaurian or alien terror shock in the first paragraph. Again I must have picked this technique up from movies and television. And titles like “Horror in the Twentieth Century,” “Monsterville, U.S.A.,” “Blast-Off to Eternity,” “Slave Boy of Venus,” and “Journey to the Center of the Sun” were designed to hook the reader just like the titles of Grade B science fiction movies. “The Body Shrinker,” one of the last stories I wrote during this golden age, probably the summer of 1963, ends with an advertisement for Trip to Mars, the first Jack Commer “novel” which wouldn’t be written for another year. So I must have been planning ahead for something I knew would be long and ambitious. What a glorious ride it all was for a fifth grade kid! In sad contrast to this opening up, I turned in a science fiction story in October 1963 to my new sixth grade teacher, and I felt that she unreasonably slammed it down–even though in checking the story now I find that she wrote “Interesting and imaginative. Be careful of spelling” on it! Yet I felt extremely put down, don’t ask me why. It’s possible she told me later that I shouldn’t be turning in fiction; all I remember from the rest of the year is slogging through turgid social studies essays. It’s interesting that I have no tangible proof of any such disrespect, but feel it strongly to this day and can clearly see that this story finished off an era. But that’s for Writing History Part III: Unhappy Kid Interlude, or Wandering in the Wilderness, or whatever I eventually decide to call it. I think I was fearful of writing the story in the first place; it came out constrained and pedestrian, so maybe that was part of the overall karma here. In any case I didn’t write any more fiction for either that class or for myself until Trip to Mars the next spring–but again, that’s for Writing History Part III. But don’t be too hard on my teacher, either–the next month, on November 22, she had to tell the class that Kennedy had been assassinated. Only two stories were added after fifth grade: “The Attack of the Martians,” I think from the seventh grade, and “The THING From Planet X” from the eighth. Neither story has the kid sparkle, and they belong to that subsequent period where I really no longer thought of myself as a writer. But I guess I wanted to consider them part of the exalted Notebook. If any human being cares to read this far, following is the order–by date of their events–of the stories in The Blue Notebook. Later titles given to original “Spelling” titles are in brackets. Many of the dates were assigned months or even years after the stories were written. I still have The Blue Notebook and the original MSS. of all these stories, as well as Word versions complete with all misspellings. Of course I had to input them! I recognize that there’s no literary merit in these childish things, but it was fun to write them and fun to input them decades later, just as it’s been fun to write this blog post. There will probably be a Part III to this epic, as I’m finding it interesting to explore the childhood ups and downs at the beginning of a lifelong writing career. I’ve even laid out possible parts IV-VII, which would take me up to the present, but those feel more like an optional exercise.